After taking on the ULTRA4 series in 2015 and coming away with the Western and National title (see Chasing the Ultra4 UTV Championship) we were ready to tackle it again in 2016. Knowing we had to step up our game I decided that going with the latest offering from Polaris was the way to go. With Polaris’s help I acquired a 2016 RZR XP Turbo (XPT). For the build I partnered with Desert Concepts (Riverside, CA), who handled the cage build, frame strengthening, panel work, wiring, and installed the long list of parts needed to make a competitive race car (see Desert Concepts Inc. signs Team Ducky). The car was together in time to do a shake down run and some tire testing at the end of January. 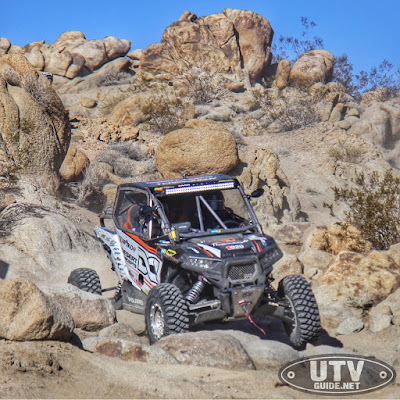 I met Mark MacDonald from Desertcraft, Mark Thornburg from MOTO RACE tire and Randy Jelleff from ATVONICS at the lake bed in Johnson Valley. The XPT had zero miles on it so I took it easy at first to break it in. That afternoon we decided to get in some of last years desert loop and open her up on the dry lake bed. Wow, was this car a beast! I ran her up to 85 mph and it still wanted to climb. We hit a few hill climbs and rock sections and I could really feel the difference in the torque and power the XPT offered. 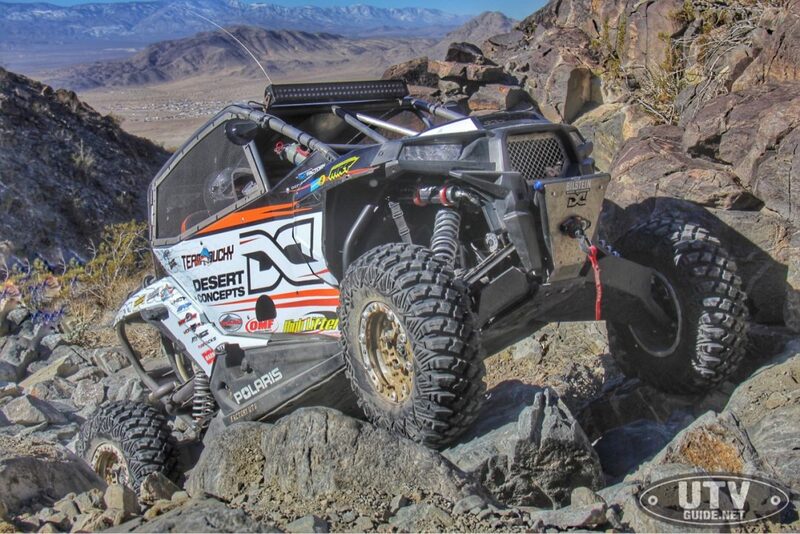 The next day Bryan Grigsby (owner Desert Concepts) arrived with his crew to do further testing and go over the car. We found some minor issues, but nothing to worry about and easily addressed during final prep before the race. We took the rest of the day pre-running some of the tougher Hammer trails. The Chocolate Thunder run, at “race speed” was made from the gatekeeper to the top in 1:20. The crew from Desert Concepts has a ton of time and experience in the Hammer trails and they helped me pick some great lines. King of The Hammers was now a little over two weeks away, so back the XPT goes to Desert Concepts for final prep, fix some of the small issues we ran into during testing and get it wrapped, (special thanks go out to ADART for the wrap). 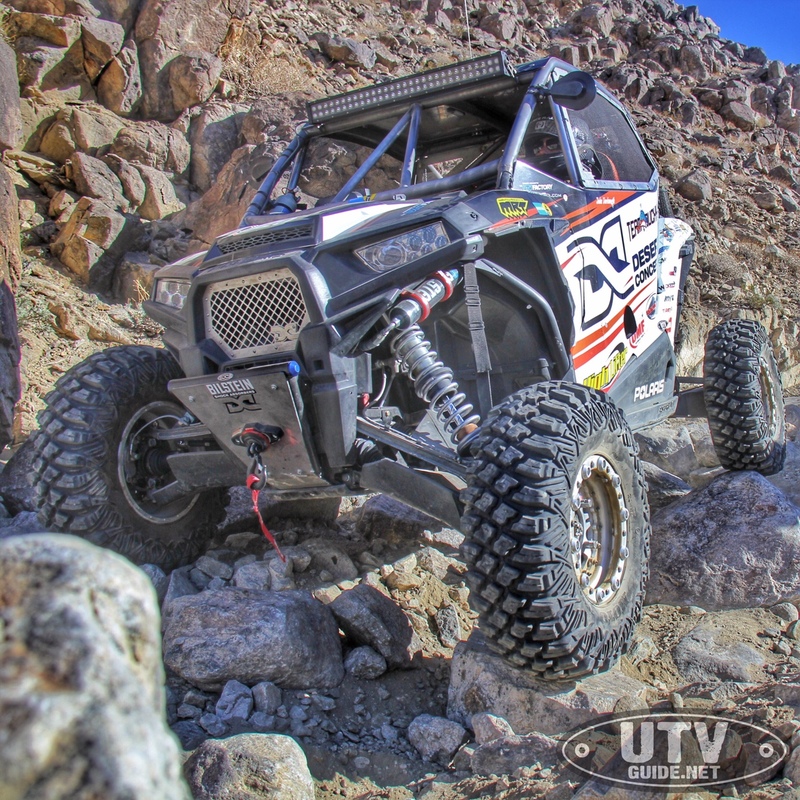 Time to get ready to race… We get to the lake bed on Friday 1/29 and start setting up. We took care of some last minute details and got into Hammer Town to get the course downloaded to our GPS. We left the XPT in camp and shot out of camp with Mark from Desertcraft in his XP1000, Desert Concept’s XP900 with JT Stephens at the wheel and Jason Wilkins in his new Yamaha YXZ. I rode Co-dog with JT Stephens. We ended up running most of the first lap marking the technical sections and hazards. Running out of gas in the XP900 on the way back was not fun. Saturday I got in the XPT to do some shock testing and I felt that the car was a bit stiff and could be improved. Mark came ready to make the changes we needed, we broke down the shocks, changed the valving and made a spring change on the front. That did it… shocks were working great and I could flat blast through the whoops. 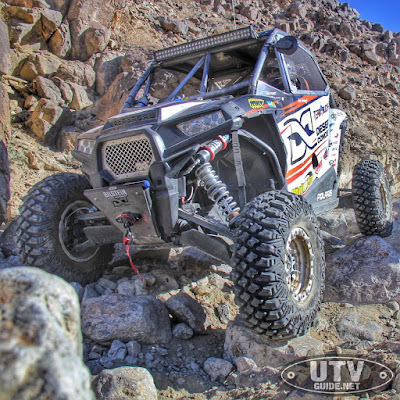 We loaded up the RZR XPT on Sunday and took it to DC’s shop in Hesperia to change out the output hub in the front diff. Thanks to Nathan over at High Lifter as he had the needed part. Monday we pre-ran the first rock section of the course and got stuck behind some EMC guys at the top of upper Big Johnson and it started to snow. We finished up Monday with Claw Hammer and Wrecking Ball. Tuesday morning RGB and I met up with Jesse Johnson and Scott Smith (Team High Lifter) Paul Hart and Bret Stetzel (Harts UTV Sacramento) Jeff Garrahan and Jean-Luc Duckworth (Friend/#1Son) and Jon Crowley (UTV Guide.net) We went straight to Jack North and then down Jackhammer. We got separated from the group going down Jack. RGB (my co-dog) and I continued pre-running the course and hit Devils Slide and Hells Gate. After going through the Highway 19-20 bypass we headed to tech inspection. At this point we were able to climb every rock section without winching. It was time to get back to camp to check over the car and get down to Hammer Town for tech inspection. While there we had PCI dial our radio and then it was time for the drivers meeting. The rest of the evening was final prep, crew meeting, etc. With Desert Concepts crew on board we had a lot more support than in years past and had enough crew to cover all three pits with fuel, tires and parts. We get to the line a little before 7am and lined up in the start grid in 32nd position. Rob Gardner-Black had signed on to be my Co-Dog again this year. We work well together and Rob has a ton of knowledge in navigation, winching and mechanical skills. We got off the line 8 minutes off of the pole position. Managed to pass 4 cars before we even got to the desert floor. 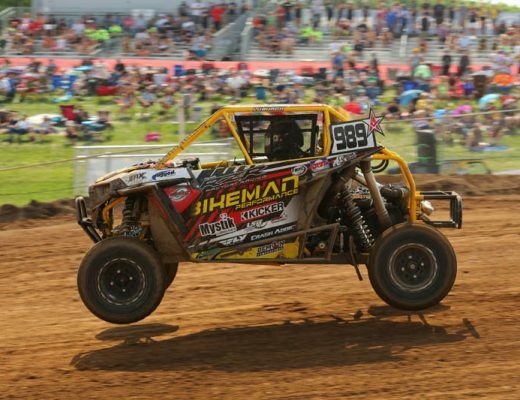 Car was fast and the Bilstein’s were making easy work of the whoops. Visibility was near zero from the dust. By the first the time we made it past pit one we had passed 10 cars. Once into the slower technical section of the desert we were able to pick off cars in groups of 3, 4 and once 5. We had just made the pass for 4th place physically and I believe 2nd on corrected time at that point when I went straight while the trail went slightly left. RGB corrected me immediately and I turned to go back onto the course. The car that I just passed up was behind and to the left of us as we were merging back onto the course and he slammed into our driver’s side at about 50 mph causing the car to go two wheeling on its side. I was able to correct the car and keep it on its wheels. We tore off and passed the guy (jackass) within about 1 minute, but the car was pulling to the left and just did not feel right. Once we made it back to pit 1, our pit crew informed us that we had a bent left upper A-Arm and left trailing arm. We got a splash of gas and continued. The damage to the car put us off race pace, but we were still holding our own. Brandon Simms passed us just before the bypass and we followed him through. Once through the bypass Brandon slowed way down for some reason and we were riding his bumper and yelling at him the rest of the way into the main pit. Yes I know he could not hear us yelling, but it made us feel better. The crew was ready for us at main pit, but we had a lot of work to do. The car was severely damaged up front with a cracked and bent bulk head, arm mounts bent, rear radius rod and trailing arm bent and two broken axles and a right rear flat. The main pit crew got the new axles in the car and changed out the flat, but there wasn’t much we could do about the rest of the damage. Off we go out of main pit, pass by pit 2A and head right into the first rock section Bolder Dash. Because of our time in the pits there were already a cluster of cars stuck at Bolder Dash. With all of the cars winching and stuck, we decided to be patient and let it clear some, I picked my line and one timed it with no winching. We made some good passes through the rocks but it had taken its toll, the car no longer wanted to turn right at all. We jump out to see that the upper a-arm had finally given up and had broken in half. Our day would come to an early end at RM 72. I would like to send out our sincerest congratulations to Jagged X’s Blake Van de Loo on his very impressive win. I would also like to thank my Co-Dog Rob Gardner-Black for continuing to be the best Co-Dog I could hope for. My Son Jean-Luc Duckworth for taking time from the Air Force and helping us out this year. Nick Canjura for his continued support in the pits. High Lifter for their support again this year and for getting us parts when we are in a pinch (Thanks Nathan). The whole crew at Desert Concepts for all of the work they have done and continue to do. JT Stevens for the race lessons. Desertcraft for showing up and taking care of business. To all of our sponsors – THANK YOU VERY MUCH! 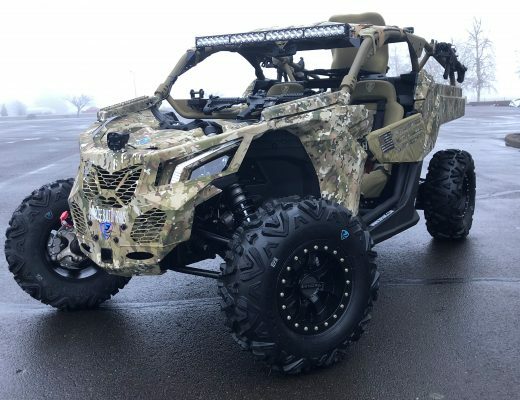 #DesertConcepts# Polaris #Highlifter #OMF #MotoRaceTires #Bilstein #FactoryUTV #Desertcraft #TireBlocks #GibsonExhaust #ATVOnics #WickedBilt #UTVGuide.net #RuggedRadios #PRPSeats #RearLightBar #HardCoreTuning #ShockTherapy #UTVFactory #Warn #DavesSuperBushings.